The Earth is always patient and open-hearted. for the last trillion lifetimes. She can wait for any length of time. She knows you will come back to her one day. because Earth is a loving mother. She will never stop waiting for you. The world has grown larger in the past couple of centuries as we have gone beyond our villages and towns, beyond our states and countries, as we have sailed and flown to foreign parts and discovered other villages, towns, and countries. Hopefully, we have learned that the people in those other countries are just like us; flesh and blood, with feelings, emotions, likes and dislikes; that they also love certain things about life; that they love their children, husbands and wives; that they too are fallible and make mistakes just as we do. Hopefully, we have gained a broader view of humanity as a whole and now understand the greater interconnectedness of all things and that we are all responsible for what happens on our planet no matter where we live. Hopefully, we have learned that we are all the same in so many ways, because now may be the time for us to return to our villages and towns and countries, taking with us all that we have learned. Now may be the time for us to utilize what we have learned, for all humanity. With the crisis in Japan the world has changed. We must accept this fact. We must figure out how we want to live now that we can no longer rely on trade with Japan to support our abundant lifestyles. Our cars must come from within our own borders, our food must be local, our responsibility to the entire world rests on us all making changes that are good for the Earth. We must not only change our personal lives, but we must pressure our governments to change as well, to be a part of the greater world without a doubt, but to make decisions that take into consideration the larger global picture that we have a greater understanding of now that we have all become world explorers. But it is time for the explorers to take what has been learned and, with that new knowledge firmly grasped, return home and change. So how can we personally change? How can we as individuals make progress toward changing the way things are done? We can start with mindfulness. In the Buddhist sense, mindfulness is staying present in the moment, in as many moments as possible throughout the day. It is being mindful of how we walk, how we eat, how we talk. It is being mindful of how we drive, how we spend our time, how we think. It is being mindful of how we love, how we give, how we receive. It is being mindful of what we choose to look at, read, and allow into our bodies. It is being mindful of our thoughts, judgments, criticisms of our self and others. It is being mindful of our intents, our prayers, our desires. In essence, being mindful is being aware, and being aware of ourselves in the world is how we can be mindful of how we can change. In practical terms, we must first accept that we are all living in Japan now. Our world has changed. That is the first thing we must take into consideration as we turn and study our personal responsibilities to this changed world. How can I mindfully be present and aware? “Most of the time, we are lost in the past or carried away by the future. When we are mindful, deeply in touch with the present moment, our understanding of what is going on deepens, and we begin to be filled with acceptance, joy, peace, and love.” So writes Thich Nhat Hanh in The Long Road Turns to Joy, A Guide to Walking Meditation. I propose meditation in everyday life, in constantly reminding the self to be present, as the means of gaining greater awareness of ourselves in the world and greater awareness of what we must do to change and flow with the energy of nature, now guiding us in this process of change. This does not have to be anything more than reminding the self to focus on each task that we do, to do it mindfully. Personally, I try to be mindful from the moment I wake up. I am not always successful, since it is impossible to be mindful every moment of every day, but the more often I pull my thoughts back to what I am doing the more I am able to be present. Each one of those tiny moments of presence, of awareness of the moment, adds up. Being mindful throughout the day is really very simple. When I get out of bed and put my feet onto the floor, I say to myself: I am putting my feet onto the floor. I feel the floor under my feet. I am walking, walking, walking. I am waking up with each step. I am noticing the morning darkness or the morning light. I am walking. When I make my morning coffee, I say to myself: I am making the coffee. I am running the water, measuring the coffee, thanking the earth for the water, the coffee plantations for the delicious coffee beans. I am staying mindfully focused on what I am doing, turning this process into a mantra as I awaken to a new day mindfully. When I drink my freshly brewed coffee, I say to myself: I am drinking this coffee. I am drinking and feeling each sip I take. I am mindfully drinking my coffee. As the day goes on, I continue to remind myself to pay attention to what I am doing. When I eat, I say to myself: I am eating now. I am eating this delicious food that someone else has grown and tended and I thank them for it. If I keep thanking and focusing on what I am doing other thoughts easily leave, but they come back quickly, so I must again remind myself of what I am doing. This is practicing mindfulness. In accepting that we are all personally responsible, as citizens of the world, we can turn to the small things in life as the place to begin making the most changes, having the most impact. As we mindfully go about our day we may discover where we are sloppy with our time and thoughts. We may discover that, as we pay attention to each task, we slow down considerably and in so doing gain not only peaceful moments of calm, but discover that we don’t really need to hurry at all, because we see that in slowing down mindfully we have plenty of time for the things that really matter. And that is the crux of what our world is asking of us now. What really matters? 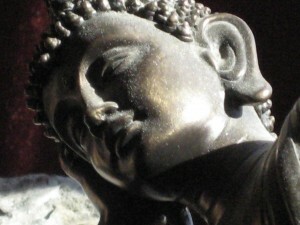 “The First Noble Truth,” writes Thich Nhat Hahn, “taught by the Buddha is the presence of suffering. Awareness of suffering generates compassion, and compassion generates the will to practice the Way.” If we are to practice the Way, live mindfully in balance with nature, inner and outer nature, we must be aware of suffering. Right now there is suffering in Japan, in the Middle East, and in our own countries there is suffering every day. We can mindfully remind ourselves of this by saying: I am aware of the suffering in Japan. I am aware of the suffering as the wars in the Middle East are waged. I am aware of the suffering in my own backyard. I feel this suffering. I accept the truth of suffering. I know what it means to suffer too. 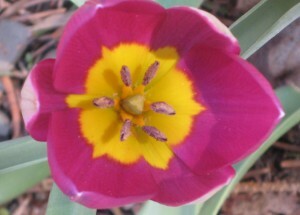 I now turn my heart outward and send compassion on the wings of intent. I am mindful of my power to change and to change the world by my intent. This is mindful living. Try it. Thanks for reading and passing these blogs on to others! Sending you all love and good wishes. If you wish to correspond, please feel free to post a comment below. And don’t forget to check out our facebook page at: Riverwalker Press on facebook where we post daily comments and quotes. Apparently this also happened in the Chilean earthquake of 2010, as you will read. Written by Jan Ketchel and including a channeled message from Jeanne Ketchel. Today, I present a few earlier messages from Jeanne. In 2006, over a period of months, her messages warned of coming change, of many natural events that would force mankind to rethink how he lives and the necessity for all of us to simplify our lives and realign with nature in the wake of these natural phenomena. At the time, we did not have a forum for presenting the channeled messages. I was still in the learning process, trying to figure out how best to utilize what I was receiving from this sentient being once named Jeanne Ketchel. Chuck and I took the guidance we received to heart, as I gradually accepted the challenge to more fully embrace it as a way of life. Shortly after that, by the end of December that year, we did begin to send the messages from Jeanne out into the world. We have repeatedly seen how accurately she portrays mankind and the truth of where we now are. So, in light of recent events, it feels appropriate now to present some of these earlier messages, mostly in an effort to underscore that we are indeed in changing times. Jeanne’s mission group is concerned with reawakening the ancient spirit of knowing in mankind, but she often mentions other groups oriented toward enacting other awakenings, including a group whose mission is the environment. Watch as things begin to slide away and disappear, as towns and villages tumble down into the mouth of the angry earth. Watch as hunks of land drown in the thirsty ocean and the balance that is so upset turns upside down… This time on earth is crucial for all… This is not just going to happen in nature. It will also happen in the hearts of man. Be aware that nature reflects in its turmoil the inner turmoil of mankind. There is a need for abrupt change and although man is perfectly capable of enacting this badly needed change, he has waited too long, so it will be done for him. Too late to have control now; await what happens. As humanity faces the most devastating of human disasters worldwide in the times to come, there will be a replacing of many values with true spirit, and this true spirit will be the one who shares sameness with others. This sameness will be unspoken for the most part, for it will not have adequate words in which to describe itself, but there will be acknowledgement of it. There are other forces, other mission groups that wish to return the earth to its original state of pristine balance with ecosystems in total acceptance of each other, functioning properly, and with man’s place among them accepted as visitor and not as owner. If man can get to this point and treat the earth itself as the greatest phenomenon in perfect functioning order, needing no interference, no tweaking, no taking from, and no destruction, then perhaps that ideal planet could possibly exist. In order to alert the many who are asleep and unable to awaken, our mission is being enacted in combination with advanced systems (missions) on many fronts: spiritual, biological, physical, ecological, and emotional. Do not discount any of the signs that are around you. Do not dismiss the facts that daily are presented in the dismal state of affairs of the world, of the Untied States, of the Arab world, of the wars between lands, between religions, between races, and between peoples, both one or two or hundreds. These things—interspersed with greed for power and money, for wealth that has no bounds, for amassing larger and larger fortunes, of unstoppable desire—is not at this time anything more than the enormous sign that change is being forced upon you all. Because change is what the earth, the air, the universe desires. Accept this fact and then see what happens…change will cause new insight. New insight will awaken new truths and thus will there be hope; and when there is hope there is possibility. Household wise, each household must be prepared for outages of electricity and times of isolation and devastation, so be prepared for lengthy times of unavailability of the staples of life… This is the beginning of a new independence that will be forced upon mankind… It will present a new way of life and the skills of the forefathers will be necessary to study… The potential for natural disaster to overtake the best proposals of man to hold back the waters will happen around the world. It is wild in its process once begun and it has no cause to stop. It is planned now to further along the evolution of man and earth, and the swirling waters will be the first step. After that many things will change and there can be no saying what will happen as people react. My impulse it to instill goodness in man, so that there becomes not greed and not fear, but true spirit awakening and caring for all mankind. Aside from the flooding waters there will be famine and widespread death. Masses of people will perish as the earth undergoes rigorous changes and shifting of plates. Subterranean caves will collapse as this happens inside and outside the earth. The shape of the earth may slightly shift and become oblique, so that perfect planet will be slightly askew, and the resulting revolutions of the planet will be a-kilter. This will have further impact upon the life of the planet and a new age will be upon the physical earth. Apparently, this happened with the earthquake in Japan that caused the tsunami, the shape of the earth changed. I will try to find the reference to this later. Man will survive, but in a greatly diminished fashion. He will not rule in order to gain power, but will be forced to live upon the earth as a grateful guest. This is the only way he should live there. This should begin now being the way of man. Do not destroy anymore that lovely place full of such potential. Do not inflate the possibilities of man, but instead allow man to sink down to the level of the animals and the knowing creatures of earth and become again a true walker upon that earth. To seek empowerment over nature will never win out. To seek instead involvement with nature as the guide is to begin a process of becoming once again the visitor that man really is. If a return to the beautiful garden is to take place then the hands of man must be removed from the soil and all that he has put there as well. Nature will replace itself in its own fashion and this will be the way that the garden will return in all its beauty. Then will man have to learn again what it means to be a guest. These messages are meant to alert the many who are ready, to tell you that it is time for global caring and global kindness, but first you must give those gifts to your self. Break down your own internal earth and allow the devastation of that which inside you prevents you from actively addressing all the issues you hold yourself from. Do not be afraid to crumble the old walls that block you from your own truth. First this must be undertaken. Then, from this new place, can you begin to pare down and simplify the life you each lead and find your true needs, keeping only that which is necessary. In this way, you will be able to conscientiously become a part of the movement that will, in fact, be a gathering of spirit energy that will know the rightness of every move and be able to engage far-reaching compassion and caring, so that all who walk upon the earth will have access to that which remains to be carefully divided and used properly. On the other hand the extremists will perish, for there will be no need of them… and their demise will eventually free the planet and the ability of nature to reinvigorate and give to those who have learned the lessons it teaches… Man must learn to react (to the changes) with heart rather than hardness; this ability will be tested. My Dear Ones, as I have spoken of many times, the world cannot, by its very nature, remain static; it must by its very potent process of birth, death, and rebirth, constantly evolve. Mankind must learn to evolve as well. The first challenge to humankind is to become one with nature rather than assume superiority over that which is far more evolved and brilliant than the mind of man. Look, as I have said in the past, to nature for your answers as to how to proceed now in life. Nature holds all you need. Even compromised nature rejuvenates and evolves, adapts so that life may continue. Man must adapt, first by acquiescing to the truth that nature now presents: that it is unstoppable. Water, so soft and caressing, carries also the power of destruction. A few drops upon a baby’s body are a gentle and peaceful experience, and yet that same water has the ability to cut through mountains and wash away villages. Man too has proven his ability to both love and destroy, synonymous with nature. Yet he holds his future in his hands. Man has choice and that is what must now come into play if man and nature are to preside in symbiosis, in right alignment. Man must choose to turn now to nature, not only for the sustenance she offers, but for the guidance she offers as well. All things reside in your knowing, My Dears. You just have not woken up to this truth yet. Wake up my sleepy ones and find within your ancient minds the truth of where you have arrived and know the truth of where you must go next. Ancient mind knows. Here is a picture I took of Buddha. 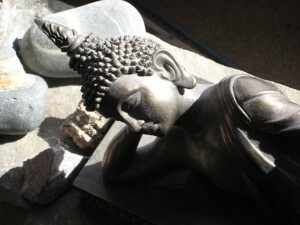 Often referred to as the sleeping Buddha in this lying down pose, he is actually dying, in the bardos between life and death. This is where we too are now, in the bardos, being asked to wake up and be aware of everything that is happening to us. These moments of awakening are the moments when we can reach enlightenment; with awareness we can truly evolve. This is what we are being challenged with, right now. Happy waking dreams! Thank you to Jeanne. Please feel free to post comments or respond to this message in the post/read comments section below. Also note the new button icons for easier sharing of the messages and our Facebook badge in the left sidebar. On our Facebook page we post daily quotes and comments and invite discussions on the discussion board. Please feel welcome, and thank you for passing the messages on! Most fondly and humbly offered.